Once a new way of exploiting or hacking WordPress is discovered, hackers are quick to scale up their activities across the many WordPress sites that might not yet have taken measures to address that weakness. 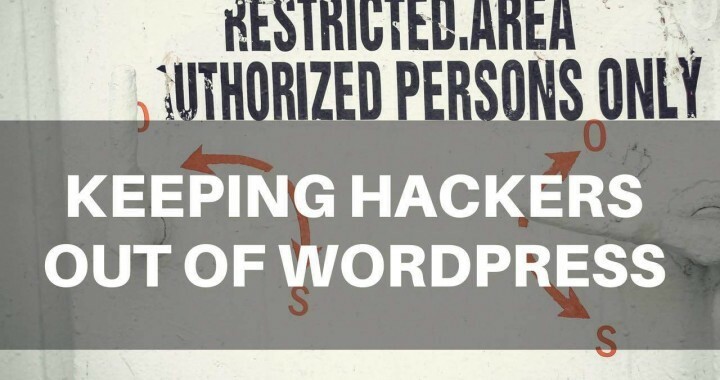 Why do people hack WordPress websites? Sites are hacked for a variety of reasons. Besides the obvious reason of causing wilful damage, WordPress is often hacked by spammers looking to use your site to help them rank spammy pages in Google. This is done by injecting links into your site, linking back to spammy pages. What are common ways hackers attack WordPress? Attack old versions of WordPress - Older versions of WordPress have commonly known security weaknesses. Hackers search for older WordPress sites which have not yet been upgraded and access them with these known exploits. Attack old Themes and Plugins - Themes and WordPress plugins often introduce their own security weaknesses into your site. If you have older versions of themes and plugins that have not had their security holes patched, then hackers can exploit these known issues to access your site. Guessing the Admin Password - It's surprisingly easy to guess passwords using special password-guessing software. As most WordPress users do not delete the default "Admin" username, hackers simply need to guess your password using their software and then that have complete access to your website. Attacking other Public Services - Hackers can scan your website to look for "open ports' on your server. If they identify a mail server or FTP server, they can attempt a brute force approach to guess your passwords or exploit known weaknesses in older versions of this software. Use Social Engineering - The most talented hackers use social engineering to gain access to your website. For example, this might involve them calling up your business and pretending to be your web developer or hosting company with the goal to get you to give up access to your site. Besides the obvious cost of lost sales and getting your site back online , a hack can potentially lead to your website being removed from search engine results. This typically stops visitors from clicking through to your website, and you will see a sudden drop in search engine traffic. Choose a hosting company that has robust security features. Different companies offer different options n helping keep your site secure. Speak to them about any security concerns, options for using Sftp or SSH to access your site, SSL on your site and other measures to avoid exposure. If you own your own server, clarify that your technical team has put measures in place to stop or mitigate hack attempts. If your website is hacked, restoring it to a previous version is one of the most effective ways to remove the hack. Of course, this means that you must have the ability to identify when the site was hacked and the exploit or back door introduced. Your web hosting company may already have a system for the automatic generation of backups. You might also consider the use of a WordPress backup plugin that generates backups or manually download your website files to a company server. Outdated plugins often contain exploits that can be used by hackers to gain unauthorized access to your website. To minimize this risk, you should always update plugins whenever instructed to do so. Also, by minimizing the number of plugins used by your website, there will be fewer that may contain exploits and your website will also run faster. A weak password or a password that is infrequently changed can be much more easily guessed or bypassed. One solution is to use a strong password generator. Remember to make sure that the password is a mixture of letters, numbers and symbols. Mix lower and uppercase letters. Write the password down nearby rather than creating a password that is easy-to-remember and easy-to-crack. If you have more than one admin, you should create a password creation policy so that your fellow admins do not make a mistake that would compromise your website. It only takes one weak password for your company to have a massive security hole. Implement a system that limits the number of failed login attempts. This will prevent hackers from using brute force methods to crack your website's password. Make sure that as many files on your server as possible are locked down under the files permission option. Many websites are breached because the computer used to log-in administratively is compromised by a virus. Make sure that the anti-virus software on your company's computers is up-to-date. Also, limit the use of whichever computer accesses your WordPress website to minimize WordPress security issues. Try to avoid accessing your website from a public computer. If it is essential that you do so, always clear your cookies afterward. Otherwise, someone else who accesses the public computer would have access to your website. If your website is hacked, the hacker will modify your website's code. Fortunately, your web hosting provider can scan the files on your website to determine which ones are infected. If you have created a backup, you can replace these infected files with clean versions. Another option is to download the WordPress package and to upload these files to your server in order to overwrite them, including the files that have had the malicious code added. If you act quickly, you will minimize the damage that is done to your search engine rankings and your company's reputation. Above all else vigilance and not taking the easy option with your site is the best way to keep it safe.